Located 4.5 km from Khajuraho Airport and 8 km from Khajuraho Station, Hotel Chandela is set within 11 acres of landscaped gardens. Featuring a shopping arcade, it also has an outdoor pool and 4 dining options. Fitted with sofas, the air-conditioned rooms have satellite TV and a safety deposit box. A minibar and tea/coffee making facilities are also provided. 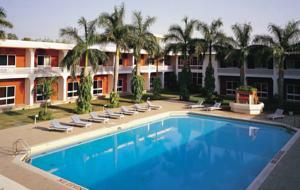 Hotel Chandela is 1.2 km from Lakshman and Khajuraho Temples, and 2 km from Tribal Art Museum. Panna National Park Tiger Reserve is 15.4 km away. Activities at the hotel include mini golf, tennis, and badminton. Guests can also exercise at the gym, or play indoor games. The hotel also has an art gallery. Local and international dishes are served at Rasana and Rimjhim restaurants. The 24-hour Café De La Paix offers light meals, while Sura Sundari bar features a variety of cocktails. Rooms: Hotel Rooms: 90, Hotel Chain: Taj Hotels & Resorts. Free! One child under 5 years stays free of charge when using existing beds. One older child or adult is charged INR 921 per night in an extra bed. The maximum number of extra beds/baby beds in a room is 1. Any type of extra bed or crib is upon request and needs to be confirmed by management. Supplements are not calculated automatically in the total costs and will have to be paid for separately when checking out.